Take rubbings at tombs across the island to unlock a trove of ancient knowledge. Travel just north of Vivec City to the Othrelas Ancestral Tomb. 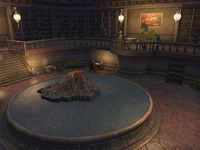 The Library of Vivec, run by Librarian Bradyn, can be visited from the lower level of the Temple Canton in Vivec City. The north entrance is below the Shrine of Generosity, and the south can be found under the Vivec Temple Wayshrine. Inside, speak to the Librarian. He will ask for your help filling out a model of Vvardenfell, by gathering rubbings from each of the thirty ancestral tombs of Vvardenfell. These rubbings will contain clues to an ancient trove of writings on the Great Houses, called the Library of Andule. He wants you to start with the Othrelas Ancestral Tomb, located just outside the city. Head north from the main Vivec City wayshrine, and take a right at the T-junction. The tomb is just a few pages south of the far end of the short wooden bridge. (You may be able to see it from the city, depending on your settings.) Take the rubbing and head back to the Library. Give the rubbing to Librarian Bradyn, who will then reveal that, using magic given to him by Vivec, he can not only record the clue to the location of the Library of Andule, but also fill in a piece of the unfinished model of Vvardenfell. Tell him you're ready and, after a short pause, the new piece will appear on the map, showing the area around Vivec City. Librarian Bradyn will give you a reward and the quest will officially conclude; however, keep an eye out for more ancestral tombs in your travels around Vvardenfell so you can take more rubbings and turn them in. There are actually many more than thirty ancestral tombs on Vvardenfell. The ones you are looking for are intact, with a stone marker, and no accessible interior. For a list with locations, see the associated achievement page. The tomb rubbings (both for this quest and for the achievement) are not considered quest items, and will therefore take up inventory space. To start the process of solving the mystery of the lost library, I need to take a rubbing at the Othrelas Ancestral Tomb, to the north of Vivec City. I took the rubbing at Othrelas Ancestral Tomb. Now I should return to the library in Vivec City and give the rubbing to Librarian Bradyn. I gave Librarian Bradyn the rubbing. Now I should talk to him and ask what happens next. Finishes quest The Librarian utilized some sort of magic to add a new section to the miniature map of Vvardenfell. I should talk to him and find out how I can help him complete the model and locate the lost Library of Andule.